Riding the river! Its a day that always deserves an exclamation point. 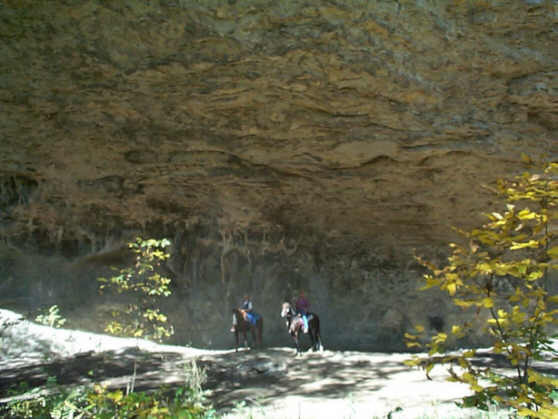 On horseback, there's a leisurely pace that lets you examine every wildflower, every rock. 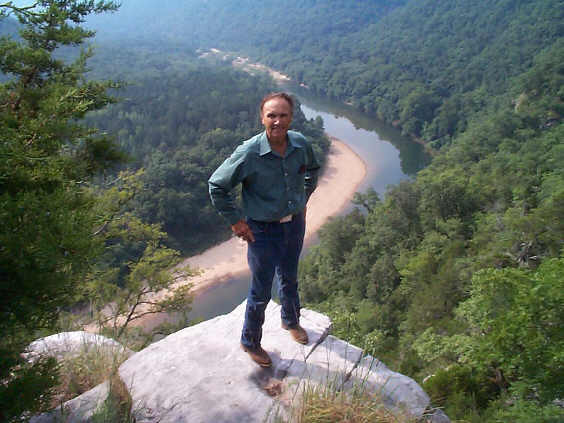 The views, the joy of being outdoors, the peace and solitude far from pressures and stress, all add up to dozens of reasons why Searcy County resident Leon Cooper always adds to his goodbyes, "Have a good day. I will!" 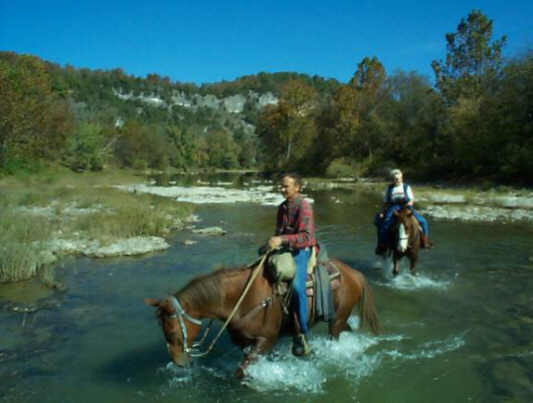 Come along with him as he shares a little about a typical day of horseback riding in the Buffalo River country. Helen and I plan to ride Friday. We will leave early to beat the heat. 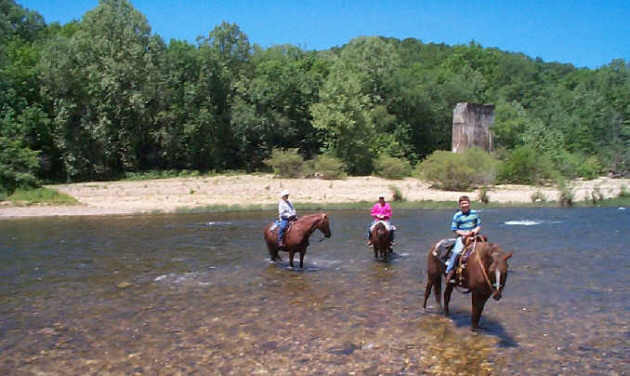 We want to ride to Cedar Creek and come back out at Horseshoe Bend. I tell her to call when she gets up. A little after 5:00 AM the phone rings. I was already up and running. We will meet at Harriet Store. She will ride Duo. Her horse's leg has not healed from the snake bite. I stop at the Exxon for gas. I see Margie and Phil there and they want to know where I am going to ride today. I tell them down on the Ducks Head, a place on the river where it curves and turns making the shape of a ducks head. When we get to the parks cable, marking their boundary I turn the truck around so it will be pointing the right way when we come back. We get the horses out and Helen puts her saddle on Duo. The last time I went around this cable Tom Avey was with Helen and I. We ride on chirping like two birds. When we get to Ludlow Gap we make the big choice, Jackson Ridge Trail or Silver Hollow Trail. It will be Jackson Ridge Trail. Neither one of us have been this way before, so it will be all new trail for both of us. So we will check it out. On we go and the horses have to step over some logs now and then. We have to go around fallen trees. It is a little rough, but not all that bad. After a while we come to a big flat rock. Looks like the trail ends here. I tell Helen, look at that bluff over on the other side of the river. It was beautiful and so plain to see. It is Gage Bluff, I have never been there. I forgot to ask Helen if she has been there. I will ask her when I see her. We will go there one day, maybe next week. I think the trail goes to the right and Helen thinks it goes to the left, dropping down. She was right. I should have left that part out, ha ha . We get within 100yards of the river and no trail at all. I said, "Helen it is not far to the river." She said, "You cut the trail and I will follow." 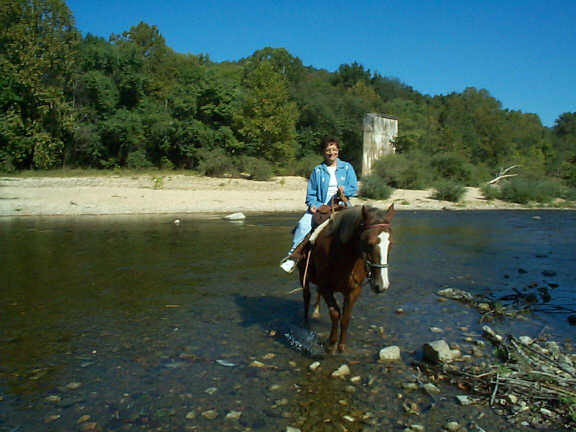 When we get to the river edge it was straight down and the water would have been over the horses head. I see a spot up stream and we will be able to get down there. We double back out and move over where I think the spot is and we hit it right on the nail head. It will be steep going off here. There is a one foot wide place at the bottom before we go into the river. I lead Firecracker sliding down and get on. Helen tied the reins on Duo and gives him a slap on the rump. He comes sliding down and I am waiting. I caught him and Helen was right behind him. She steps into the saddle and we are ready to go. The water is clean and does not look too deep. Firecracker steps in and in two steps it is halfway on his side. It does not get any deeper. We come out on a gravel bar. We hear a boat and wait to see who it is . It is a Park Ranger in a park boat. We wave and he goes on down stream. We get on the bank and there is a little trail. Soon we come to a big cable. One end is loose and goes into the river. I tell Helen I think it was used to bring ore across the river. They had a big metal bucket and they pulled it back and forth hauling the ore. We are at Rush Camp Grounds. We get off and I see a little boy and I ask him if he wanted to ride. His mother brought him over and I walked Firecracker up and back. I peel an apple and Helen and I wolf it down. A Park Ranger drives up in a little blue truck. I ask her if she knows Tracy. She says, "Yes." 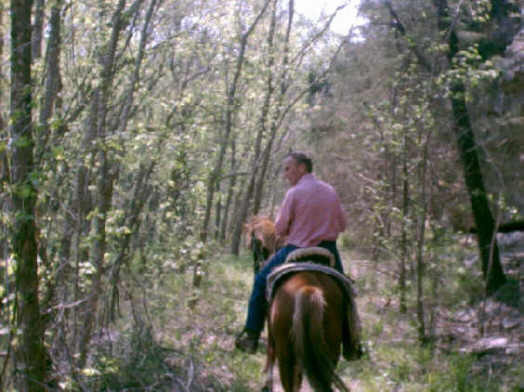 On we go and we have to go down Clabber Creek to get back to the river. When we get to the river we spot where we want to come out. We start across. I can feel Firecracker's feet slip off of the slick rocks. We make it and no problem. We are on a sand bar and riding down river. Just before we get to Silver Hollow , I see a beautiful bluff. We turn up Silver Hollow. It is rough going up here. The ditch and old road are the same. When we get on top Helen says, "You know the beautiful bluff we saw?" I say, "Yes I do." She wants to go there to eat lunch. Sounds good to me. We head down the trail and soon Helen turns into the woods. I am close behind and the ground is a little steep here, but I follow her. Then it gets real steep and I see the bluff. I think we have ridden close enough. Helen says, "Come on." Duo is sliding on his tail. Firecracker is behind him and I can feel Firecracker's feet slipping under him. It levels off a little, but not much. We tie the horses and their tail is higher than their head. We go to the edge of the bluff and sit down and hang our feet off over the edge. I had a pork sandwich in my shirt pocket. Helen had a salad. This is great. We see two canoe's coming and we yell when they get into hearing distance. We point and talk. We can see all the way back to the camp ground at Rush. The horses rest and we are looking all over. The mountains at one point look like ribs. We get our look out and get ready to leave. I was going to follow Helen. She said, "You take the lead." Firecracker took the hill at an angle, that way it was not so steep. Helen and Duo were right behind us. I caught my breath when we got back to the trail. The bluff has no name on the Park map, so Helen and I will call it Silver Bluff. We see vines twisted like rope, sink holes everywhere and beautiful over hangs. Some of it looks to real to be true. These places Helen and I call our second home. She is the best person to ride with and she says the same about me. I see the Park cable and the truck will be on the other side. When we get to the truck Helen takes her saddle off of Duo. We load the horses. Firecracker tips one hind foot up and the shoe would have come off in another five minutes. Ha ha We get in the truck, take off down the dirt road, turn the air conditioner on and start planning another ride on another day. We love it. It is never tiring or boring to us. Never too cold or too hot. Maybe we say we will make it to Cedar Creek next time.